If you are visiting southern California, this is a great location to hub from. Warm in the winter - cool nights / HOT in the summer! There are three bedrooms, two with large queens and a third bedroom with a small corner desk and a convertible Danish style couch that makes to a full bed. Ample linens, towels, blankets and sheets. So a nice place if you need to visit family or want to be central to everything in Southern Calif.!! FREE: Wi Fi- Cable T.V. copier. Centrally located from San Diego, Los Angeles, Orange County, Riverside Counties and Palm Springs-Desert / Temecula areas. There is so much to do in a 1- 2 hour drive! Everything is within this driving period: L.A., Disneyland, Knott's Berry Farm, Hollywood, Palm springs, Casinos, hiking, San Diego, Mexico, Beaches, Mountains, Apple Country. SEE IT ALL FROM HERE!! After you book- I will give you pointers and tips, discount coupons for your excursions, no charge. One story, great for snow birds or for visiting friends & relatives. Granite Countertops, New Cabinets & Appliances - Modern kitchen. Fully furnished. Pool. Dining room, a work station, fireplace, all you will need except for clothes, personal toiletries and food. Very serene, private and quiet! Pets on a case by case basis. Cats but ok but no more than 1 small non barking- house broken dog. Please don't ask if you have 2,3 4 or more dogs. Housebroken only. Extra charges for damage or dog waste not picked up daily. Smokers - NO inside smoking or throwing cigarette butts outside, Please! Pool in the summer, not heated in the winter. Clean and quiet! You might want to contact me as some web sites that glean this information have a higher or lower daily rate posted. From May through September there is a $10. per day charge for air conditioning. de sac to the south. Why? There is a gardener and pool man that come in the yard weekly. We keep some condiments in the fridge and items in the pantry for you to use as well. This is a clean home with a fireplace for the cold winter nights and a nice pool for hot summer days. the pool is NOT heated. The yard is very private. Many people are returning each year. This is a very clean single level home that is very functional. Please do not plan on renting it for a two or three day party(s) or receptions. The house is fully stocked with appliances, soap, plates, utinsils etc. BRING clothes, toiletries and buy food. Everything is there for the lady's hair, too. I didn't, use it for a third home. Now most of the work I need to do in the area is completed. I kept this home as it is an easy home to live in and is a very nice and a comfortable quiet place to stay and visit. There are only seven homes on the street. The center of town is less than 2 miles away with all the conveniences of a major city! 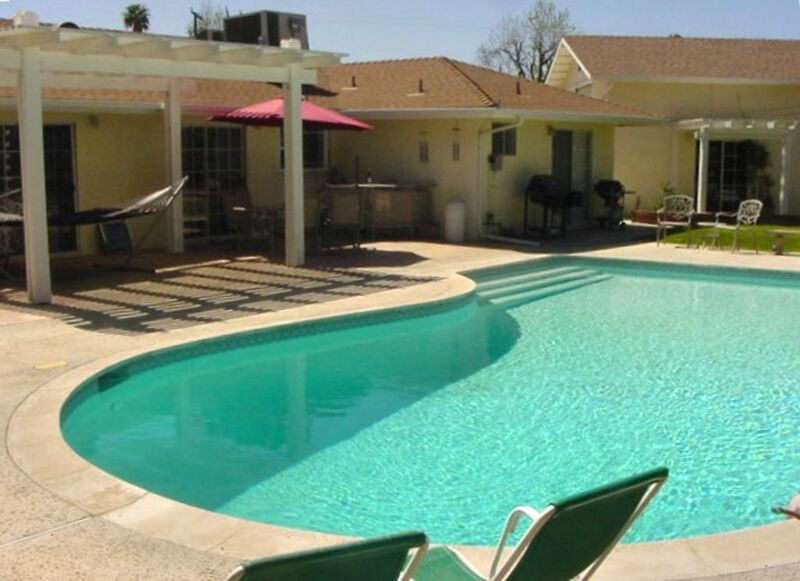 The pool and yard are huge with a bar-b-que and two patios.- it is serene and private. The pool is off the patio and the patio is off the kitchen - so an easy home to relax in with the beverages or prepared food and not far away from the patio / pool area! You still have two grass yard areas as well and another covered patio area! A work station as well as all the kitchen appliances, flat and silverware, pots /pans etc. Cable T, V, Blender, Citrus fruit in season/w juicer, Coffee maker. the 3rd bedroom is an optional office with hide a bed. Carl was so accommodating to our needs and ensured we were comfortable. The home is laid out very nicely and clean. Small extra touches were very appreciated. California or Bust for this Brother! Our trip from Iowa to California was for two brothers, both in their 80's that had not seen each other in over 5 years, to get together, one more time, for a couple of days of reminiscing, family story telling and to make a few more "memory moments" happen! Mission accomplished! This house rental was perfect for our adventure! The home was comfortable, spacious, clean and in a very accommodating location within the city of Hemet. The private backyard, pool and patio provided the perfect location for enjoying the sunshine along with a glass of freshly squeezed limeade! Carl, the owner, could not have been easier to work with for scheduling our arrival and departure. He was very understanding of our situation and offered much needed advice and guidance for services in the neighborhood. The home was exactly as it was advertised to be, with no "hidden" surprises, which was a great relief! The backyard lime tree? A total bonus for margarita night! Came to visit family and stayed here for the week. The house is arranged quite nicely inside, with plenty of room, and is kept up very nicely. Sleeps 5-6 comfortably. Master has plenty of furniture and closet space, and an on-suite with shower. Second bathroom available as well (tub only, no shower). By far the best part (in my opinion) is the pool/patio/outside garden area. On hot summer days, this is certainly the place to be! There's plenty of seating with two outdoor patio sets, a propane grill for BBQing, a refreshing pool (which doesn't need to be heated in summer), all surrounded by beautiful gardens/foliage. Great communication with Carl (owner) before and after the rental, with a brief check-in after the first day to ensure all was well and needs were addressed. If you're planning a visit to Hemet and fancy a rental property in lieu of a hotel, you can't go wrong with this one. Great location, enjoyed the pool. The house was great for my family and my teenagers. Enjoyed the quiet place and privacy of the fenced backyard. Kitchen was awesome for cooking. Will recommend family to stay and enjoy this lovely home. We had a fantastic time staying here. A wonderful property in a great location. Everything is as described in the pictures and the communication from Carl is great. We wanted space as we were travelling with a 12 week old baby and this accommodation certainly delivered. The rooms are spacious, the lounge is comfortable and the kitchen and dining room have everything needed. Our eldest son loved the pool and putting green and the outdoor area is fantastic. Sometimes swimming pools appear larger than they are in photos, that was certainly not the case here with a great sized pool, plenty of sun loungers and the most comfortable hammock I would go out and buy tomorrow if we had the weather for it! We found Hemet to be a good location and travelled from here to Disney and San Diego Safari park. Much preferred an hour's drive on quiet roads to staying in the centre of LA. The Science Museum in Hemet is well worth a visit if you have children. Fully recommended. Three bedrooms property with large pool, fully equipped. third bedroom has a rock n roll double, master has on suite,. Handy for San Diego and Southern California. If you coming for less than a month the total amount is due as well as the $500. Damage, pilferage deposit. Cleaning fee for full households stocking fee is $75. per booking... Just bring your food, clothing and toiletries. You should wash your sheets and towels prior to leaving. Do not make the beds. The cleaning crew charges me $25. for each load of laundry left in pile dirty. All soaps are there:, dishwasher, bar of soaps, laundry soaps etc. If you coming for longer than I am flexible on when to pay. I have my own 3 page short term rental agreement to have you sign. thank you, CARL The nightly rate is less if you book over 4 days. From May 1st through September 15th - there is a $10. per day electric surcharge for the air conditioning as it is hot! If you book over 60 days out you can pay 1/2 if over a a two week stay. Balance is due 30 days prior to arrival. This is a nice home -- place to utilize in these four sothern counties counties: L.A, Orange, Sand Diego, Riverside. BTW I net 78% of the fees. The rests is transient tax and processing fees here.. Am not gouging at all.